Budapest – Hungarian Prime Minister Viktor Orban is refusing to condemn a financial magazine in his country that last week featured a cover that has been widely called antisemitic. The cover of the magazine Figyelo featured a picture of Andras Heisler, the president of the Federation of Hungarian Jewish Communities, with banknotes floating around him. The cover appeared in conjunction with an article alleging that Heisler had been involved in financial irregularities. 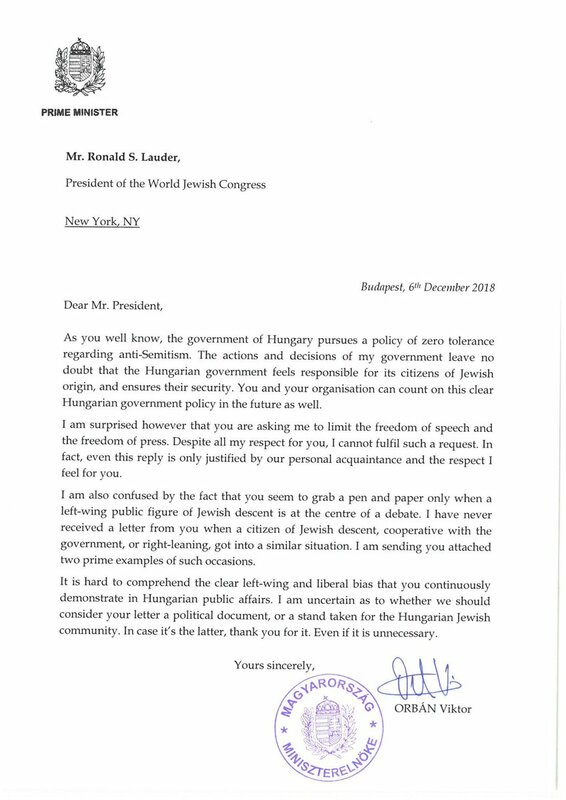 After Ronald Lauder, the president of the World Jewish Congress, called on the Hungarian prime minister to condemn the magazine cover, Orban responded on Thursday in a letter in which he said he was surprised at what he called Lauder’s request to limit freedom of expression and freedom of the press. “Despite all my respect for you, I cannot fulfill such a request,” Orban wrote. The Hungarian prime minister claimed in the letter that his government has a zero-tolerance policy when it comes to antisemitism, leaving no doubt over its commitment to Hungarian Jews and their security. He also accused Lauder of having a “clear left-wing and liberal bias” with regard to Hungary’s public affairs. Lauder had called the magazine cover, “one of the oldest and vilest caricatures of the Jewish people and it places not just the magazine, but all of Hungary in a very bad light,” according to the Jewish Telegraphic Agency. “While I understand and respect the boundaries of a free press, I believe your strong, public condemnation of this very clear attack on all Jewish people, would not just distance you, personally, from this most disgusting hatred, worthy of the Nazi era, but it would also place your government and all of Hungary in a better light,” Lauder wrote. On Thursday, in a conversation with Haaretz, Heisler, who has denied the allegations against him, called the magazine cover antisemitic and frightening, and added that he had only seen such images in history books about the 1930s. He said he would expect Orban and his government to condemn it. Last week, the office of Prime Minister Benjamin Netanyahu issued a statement saying that the prime minister’s diplomatic adviser, Reuven Azar, had spoken with the Hungarian ambassador in Israel, Levente Benko, on the matter. Azar had condemned how Heisler was portrayed on the cover and asked that Hungary condemn “any shade of antisemitism in domestic controversies in Hungary,” according to the Israeli Prime Minister’s Office. Figyelo magazine takes a pro-government line in Hungary and its owner is considered close to the Hungarian prime minister.